Motorola and Google are expected to launch the new Motorola Nexus 6 smartphone next month, the device is rumored to launch around the 15th or 16th of October. The guys from Android Police have received some more details on the new Google Nexus 6, and have put together the image above, based on the information they have seen regarding the device. Besides the form factor, we can see a bunch of new stuff just on the home screen. Revamped icons for the dialer, Play Store, Gmail, and Play apps all generally match what we’ve seen before, while there are new tweaked icons for Maps and Google, and a new folder on the home screen specifically for Drive’s suite of editing apps. 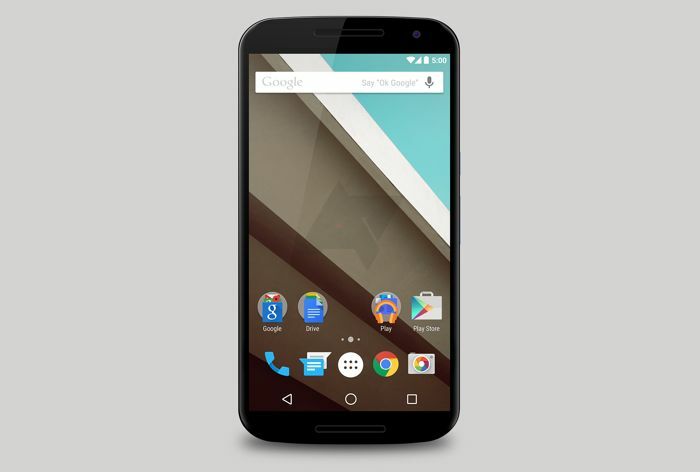 The new Motorola Nexus 6 is rumored to come with a 5.92 inch QHD display with a resolution of 2560 x 1440 pixels, the handset will apparently be powered by a quad core Snapdragon 805 processor and will come with 3GB of RAM. The Nexus 6 is rumored to come with a range of storage options, and the handset will feature front and rear facing cameras, with a 2 megapixel camera on the front and a 13 megapixel camera on the back. The device will come with Android 5.0 or Android Lollipop, Google are rumored to be releasing Android Lollipop around the 1st of November.